Lars Iyer is a lecturer in philosophy at the University of Newcastle. He is the author of two books on Blanchot (Blanchot's Communism: Art, Philosophy and the Political and Blanchot's Vigilance: Literature, Phenomenology and the Ethical) and his blog Spurious. He is also a contributor to Britain's leading literary blog, Ready, Steady, Book. "A tiny marvel of comically repetitive gloomery.... [A] wonderfully monstrous creation." "The high value Iyer places on essential human relations is a rebuke to those who deride 'experimental' fiction as narcissistic or self-indulgent evasions of emotion." "Who should buy this book? Intellectuals who face intellectual troubles in their own lives. There's a lot of biting satire about the shortcomings and general foolishness of the so-called life of the mind. This is graduate student wit, which is fearsomely funny." "[A] hilarious and eminently quotable debut novel." "A tragic mein... undercuts the sheer hilarity of Lars Iyer's Spurious....A narrative My Dinner With Andre turned on end.... To read Spurious is to discuss Kafka's The Castle and farts in one exacting sentence--all the while reeking of gin." "Evoking literary duos like Don Quixote and Sancho Panza, and Othello and Iago, Iyer's portrait of two insufferable academics fumbling for enlightenment illustrates what the author comically calls the most honorable cruelty: friendship....Solipsistic and chatty, Spurious is a comedy in the vein of Bernhard's The Loser or Beckett's The Unnameable. Echoes of "You must go on, I can't go on, I'll go on" haunt every scene." 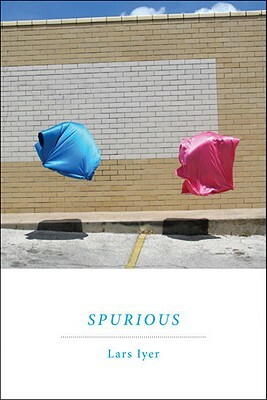 "Spurious is an amusing take on intellectual frustration and anomie, its two characters going through the motions in a world where it's unclear what the right motions are any longer." "Iyer's playfully cerebral debut [is]... piquant, often hilarious, and gutsy." "In W. and Lars, Iyer has given us not so much Brod and Brod but a pair of hilarious and entertaining Quixotes - you're unlikely to find more diverting philosophers anywhere."